When Lynea Lattanzio looks back on her life over the past two decades, providing a home for over 34,000 cats and 5,000 dogs isn’t something she always imagined she’d accomplish. Lynea is the founder and owner of The Cat House on the Kings, an animal sanctuary dedicated the rescue, rehabilitation, and rehoming of cats in California. And this “Meowtriarch’s” sanctuary is anything but ordinary. Here, the cats run the place — even more than usual. For many, The Cat House on the Kings is a complete paradise. 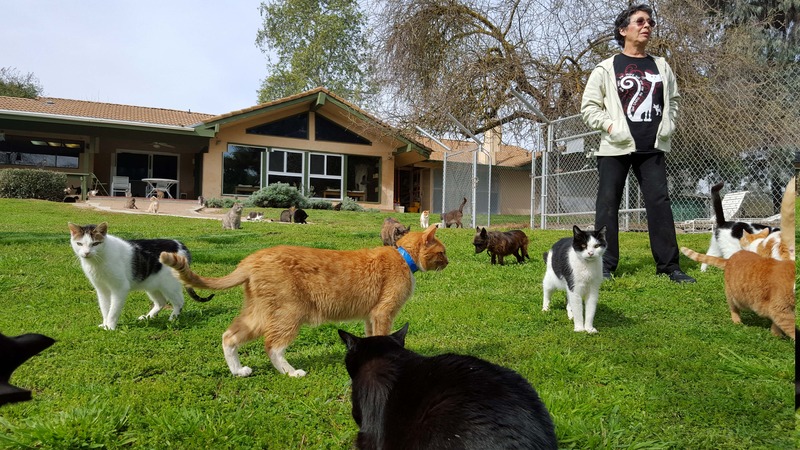 With 12 acres of land and hundreds upon hundreds of adorable cats roaming around, this animal sanctuary is just about every cat lover’s dream. But the Cat House on the Kings wasn’t always a place where nearly 800 cats and 300 kittens find refuge every year. In fact, The Cat House wasn’t meant to be a house for cats at all. After a difficult divorce in 1981, Lynea sought out a new place to call home. By 1983, she bought a 5-bedroom home on six acres of land by the Kings River. For nine years, Lynea went through the day-to-day motions of life, knowing deep down something was still missing. Then one day, her dad asked her to help him find a new cat after his two died of old age. Little did she know, that visit to the animal shelter would change her life forever. Lynea brought home 15 kittens that day, finally having found her purpose. Lynea began volunteering at a local kill shelter bottle feeding kittens. 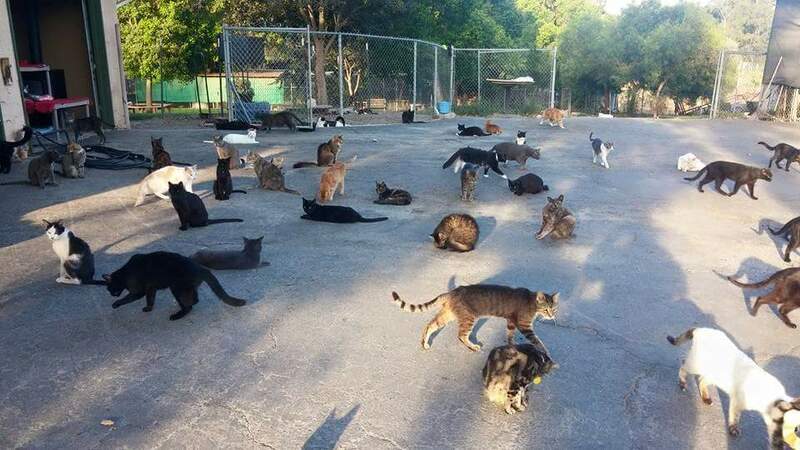 By the end of the year, she had managed to rescue and re-home 96 cats. Fast forward to more than 20 years later, and The Cat House on the Kings was housing over 500 cats and a plethora of kittens. With so many animals in the house at all times, Lynea decided to move into the mobile home on her property, giving up her 4,200 square foot home to let the cats roam where they pleased. In that time, Lynea had also become a surgical veterinary technician and The Cat House officially became a non-profit. While expenses were high and volunteers were needed, the sanctuary had catapulted into the spotlight, bringing along much-needed donations and volunteers. In 2004, donor Doreen Wallet left money from her estate to the sanctuary, allowing them to purchase another six acres of neighboring land and cat-proof fencing to encircle the entire property. 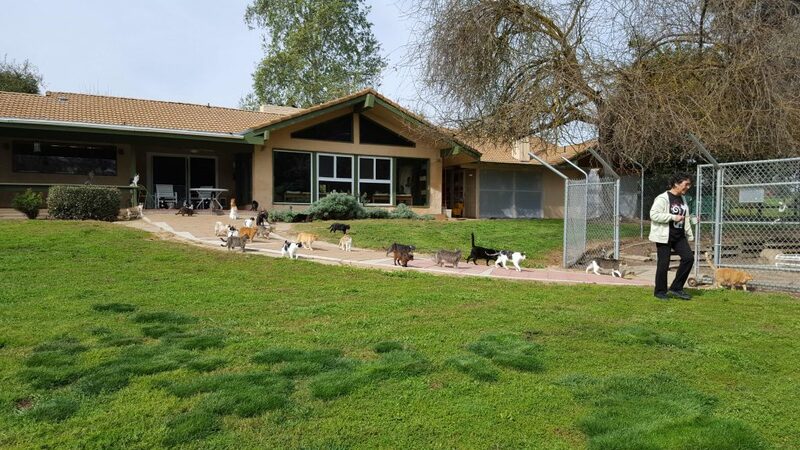 Today, The Cat House on the Kings is a sanctuary to more than 800 cats and 300 kittens, and even a handful of dogs every year, making it the largest no-cage, no-kill, lifetime cat sanctuary and adoption center in California. “Our mission is to place rescued cats and kittens into loving, permanent homes; to provide a safe, happy and healthy home for unwanted cats and kittens in a unique, no-cage facility; to prevent pet overpopulation through spaying and neutering; and to educate the public about responsible pet ownership,” their mission reads. One aspect of the sanctuary’s mission is to place as many animals as they can into safe and loving forever homes. 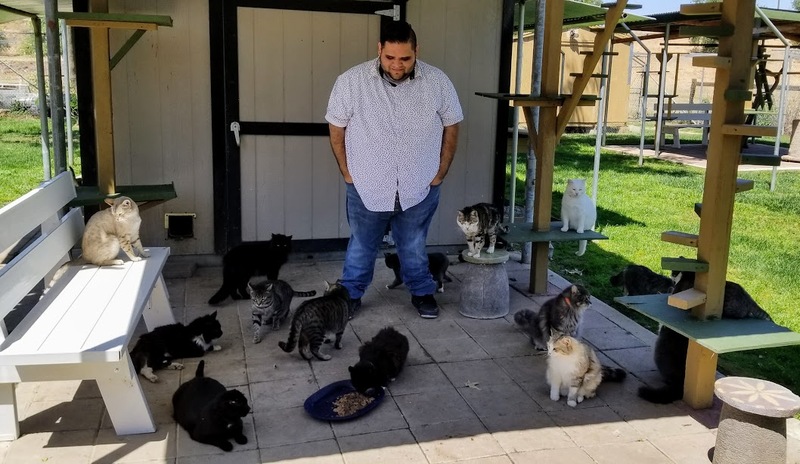 But as a lifetime cat sanctuary, The Cat House also provides a home to non-adoptable furry friends, allowing them to become permanent residents. 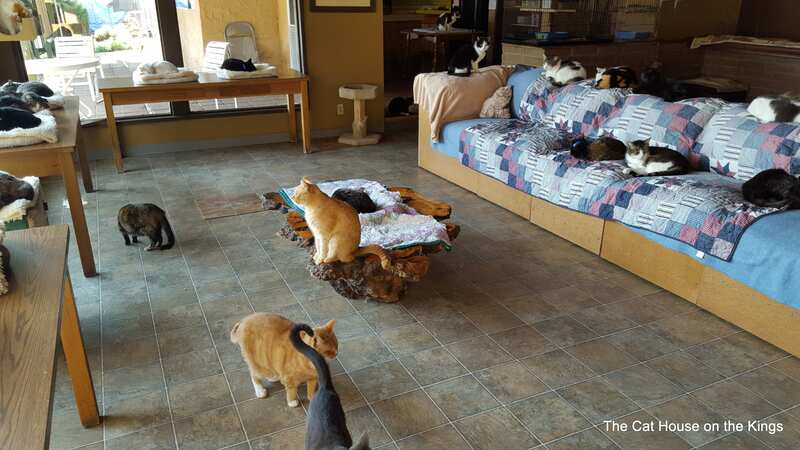 The Cat House even offers daily tours of the facility by appointment and operates an adoption center in addition to providing a safe place for cats to live. And naturally, with hundreds of cats roaming around, the daily upkeep is challenging. Morning crews will arrive on the property bright and early at 4:00 a.m. Maintenance crews arrive at sunrise and check all 12 acres for cats that may be sick or in need of medical attention, and other operations like the adoption center open for business between 7:30 and 8:00 a.m. The rest of each day follows a routine of caring for all the cats on the property. Feedings, cleanings, surgeries, intake, medications, adoptions, tours — its all in a day’s work at The Cat House. With such a busy day-to-day operation, the sanctuary boasts 40 full-time employees and 250 volunteers per year to keep things running smoothly. “We couldn’t do what we do with out them, including fostering, adoption center help, [and] cat cuddling,” says Beth Caffrey with Donor Relations. The sanctuary adoption center is open seven days a week by appointment only. Additionally, they also have an off-site adoption center located inside a local Petco. With so many incredible ways to adopt a cat in need, The Cat House averages around 1,200 to 1,400 adoptions every year. 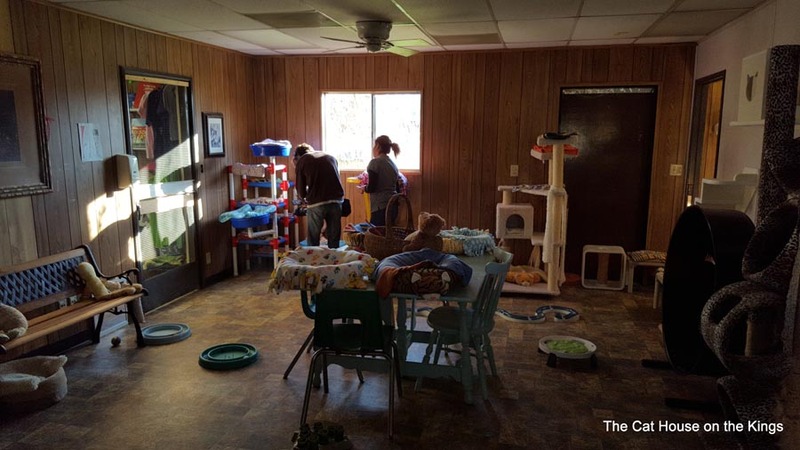 The sanctuary still heavily relies on donations and volunteers, limiting the amount of cats The Cat House can bring in each year. Lynea says the house is open to as many cats as they can rescue, as long as they are able to financially support them while also meeting demands for repairs and general upkeep. But for Lynea, giving up her home, her finances, and her entire life to the cats is more than worth it in the end. Lynea and her entire team’s dedication to giving so many wonderful animals a second chance at life is truly inspirational. May we all strive to give to those in need as selflessly and as passionately as everyone involved at this incredible animal sanctuary. To donate to The Cat House on the Kings, to adopt a cat, or to see how you can get involved, visit their website and check out their Facebook page for more information.